Square 3-Line Address Sign - - personalized 11.5" x 11.5" wall mount address plaque. Made in USA. Sturdy, UV-stabilized, laminated acrylic construction with engraved personalization. Customized with your choice of color and three-line address. Printed as shown with multiple fonts and font sizes. Black or white border is the same color as the personalization and accentuates the square shape. Dimensions: 11.5" x 11.5" x 1/8". Crafted in the USA by skilled artisans to assure the highest quality. 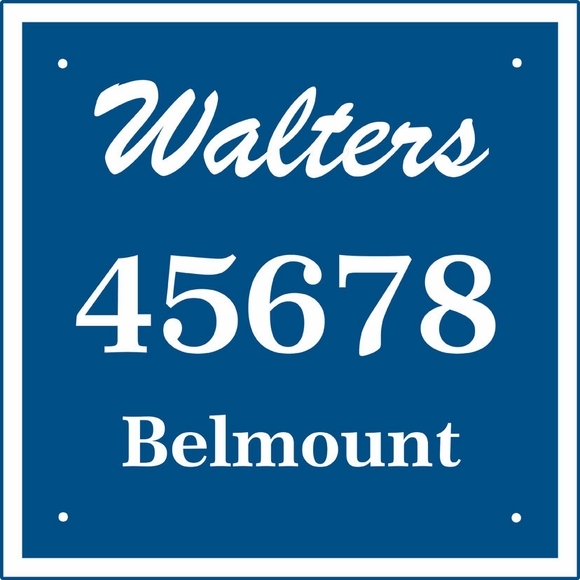 See Related Products for the one-line and two-line versions of this address plaque.